A body representing 75% of the world's independent tanker fleet has called on the UN to co-ordinate naval patrols off Somalia's coast to help reduce piracy. Peter Swift, head of the International Association of Independent Tanker Owners (Intertanko), also suggested mounting a naval blockade of the area. He said monitoring ships leaving Somali waters could be more effective than attempting to patrol the Gulf of Aden. But analysts say it would be almost impossible to patrol such a large area. Earlier, Nato's secretary-general said it was not considering a blockade of Somalia's coastline, which stretches for more than 3,000km (1865 miles). 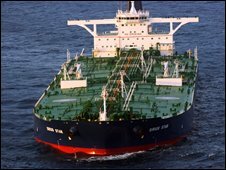 One of the pirates holding the Saudi oil tanker Sirius Star has told the BBC that they have no intention of harming its 25 crew. The man, calling himself Daybad, also said they had so far not negotiated with the ship's owners, speaking only to intermediaries who "cannot be trusted". The tanker was seized earlier this month and is carrying $100m (£67m) worth of oil. Reports have said the pirates are trying to obtain a multi-million dollar ransom. Almost 40 ships have been seized by Somali pirates so far this year. The head of Intertanko said that in response to the surge, many of its members were considering re-routing their tankers around the Cape of Good Hope. That decision would raise costs by 30%, he said. Mr Swift said continuing attacks would have a major impact on world trade, but that Intertanko opposed arming merchant ships to allow them to defend themselves against pirates. Instead, the UN should co-ordinate naval support for merchant shipping across the region, he said. Any warships deployed would need robust rules of engagement and aerial support. Mr Swift said the at-risk area was now so large - encompassing the whole of the gulf and a significant part of the Indian Ocean - that stopping pirates before they reached the high seas might be more effective and efficient than protecting merchant ships. However, Nato Secretary General Jaap de Hoop Scheffer said earlier on Monday that the alliance was not considering any naval blockade. He said that such action had not been endorsed by the UN Security Council, adding: "This is, at the moment, not in the cards." Warships from at least nine countries have been operating in the Indian Ocean and the Gulf of Aden trying to prevent pirate attacks. But navies and analysts say it is almost impossible to patrol such a large area. On Monday, a government official in Iran was quoted as saying his country would consider using force against pirates following last week's hijacking of an Iranian-chartered ship. Deputy Transport Minister Ali Taheri said Iran was negotiating with the pirates who had taken the ship, which was carrying 36,000 tonnes of wheat. Kenya reported on Friday that Somali pirates had been paid more than $150m (£101m) in ransoms in the past 12 months.